Whatsapp is one of the largely used messaging app worldwide as it uses our mobile number for identification and its simple. Now one thing that bugs people is the gap of communication between PC and smartphone’s. Generally when I am sitting on my desktop, I don’t prefer to use mobile phone. But as whatsapp is not available for PC, I have to check my messages on the phone. But this issue is now solved and you can use whatsapp from PC. People used to install bluestack to use whatsapp on PC, but that will disconnect your account from the smartphone. 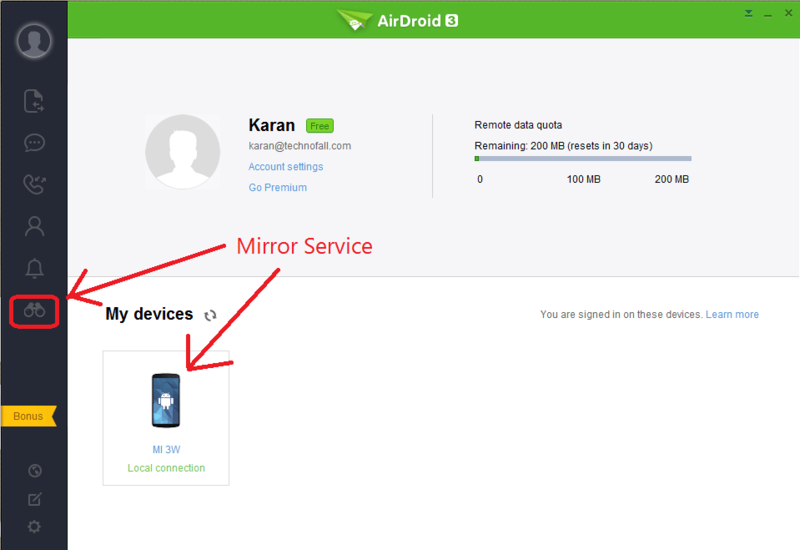 There is a app which allows you to manage your android smartphone from PC called as Airdroid. They have now launched a new Mirroring service which allows you to literally control your android smartphone from PC. Lets see how to take advantage of this service to use whatsapp from PC. How to use whatsapp from PC ?? Download Airdroid application from Playstore. After installing give ROOT access to the app otherwise the mirror service won’t work. Sign Up for an account via email or Gmail or Facebook etc. After downloading install it and sign in using the account you created before. Now comes the fun part. Click on the binoculars icon which will open a new window and load the interface of your smartphone. You can totally control your android smartphone and use whatsapp from PC. Type using your PC’s keyboard and tap using mouse click. This mirror service is still in Beta so it has bugs. Sometimes it may stop responding and you have to relaunch it. Also use it slowly as it will not be able to handle quick usage. But other than that, its fun. Enable the Mirror notification service to get notifications right on your desktop. 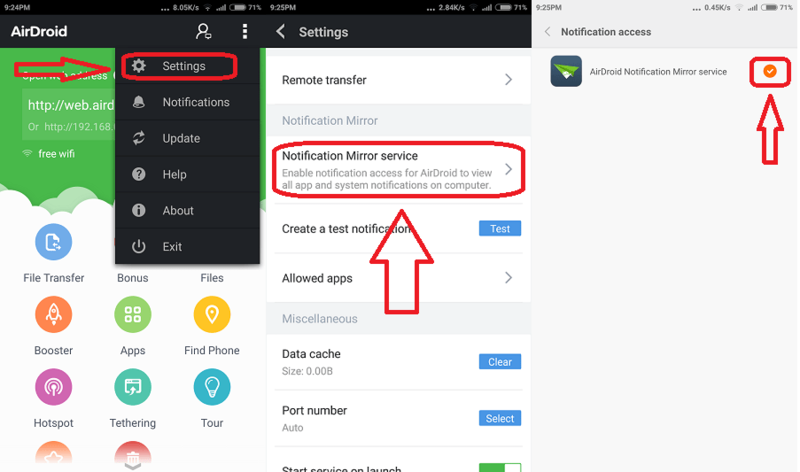 To do this tap options -> Settings -> Notification Mirror Service -> Turn it on. You can also use other apps including camera and don’t even have to pick up your smartphone. Using Airdroid you can transfer files from PC to Smartphone easily without any wires. This desktop client replaces the task done previously using the browser. Share your experience of using Whatsapp on PC with Airdroid Mirror service through the comment section below.